Fans of manga can enjoy these breathtaking and touching illustrations on the iPhone, iPod Touch and iPad. SMILE: PRAY FOR JAPAN Volume 1, contains Inoueâ€™s illustrations numbered 34 through 100 and will be available for $9.99. 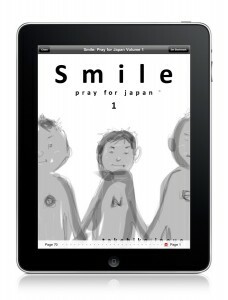 SMILE: PRAY FOR JAPAN Volume 2 will contain illustrations 101 to 120 for $1.99. As Inoue creates additional pieces, VIZ Media will continue to make them available in sets of 20 for $1.99. Takehiko Inoue (creator of VAGABOND, REAL, and SLAM DUNK, all published by VIZ Media) created these pieces as a gesture of support for the victims of the earthquake and tsunami that struck on March 11th. Using his finger and an iOS iPad app developed by Psoft Mobile called Zen Brush, he initially began drawing images of people smiling and posting them online as an experiment. On March 12th, the day after the massive earthquake, Inoue posted Smile illustration number 34, entitled â€œPray,â€ with the victims of the devastating disaster in mind. Since then he has continued to draw piece after piece, with over 125 illustrations currently in the series. â€œTakehiko Inoueâ€™s lifelike portraits of everyday Japanese people smiling have inspired hope in the wake of the terrible events that struck the country on March 11th, and weâ€™re honored to help with ongoing fundraising efforts by making them available to fans in North America,â€ says Hyoe Narita, Executive Vice President of VIZ Media.